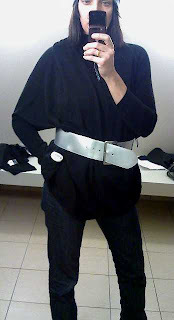 Big dolman-sleeved sweater (comes with large, plastic silver belt, no thanks) by she said, $28.99 from $58. 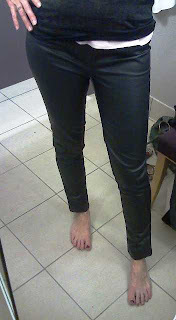 Pleather leggings by I Heart Ronson, $11.99 down from $50. These have a gathered elastic waistband. I just wore them on a plane and they were very comfortable. Also a little warm, but LaGuardia was steamy warm last Sunday night. 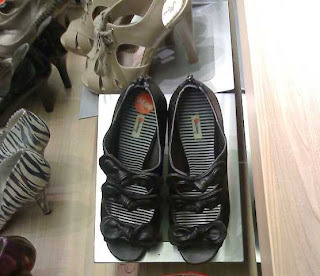 Shoes, $35.99, that I didn't get as I'd prefer some boots right now. The sweater is so fun ... but you're right. Pass on the belt. 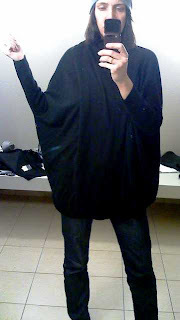 It could be fun on something OTHER than a dolman-sleeved sweater, though!